Property 5: Welcome to the “The Bear Hut”! Property 6: Pet-Friendly Bend Area Cabin w/Hot Tub & Fire Pit! 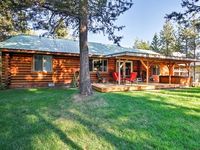 Property 10: Pet Friendly Log Cabin near Sunriver w/Hot Tub, Fire Pit, Kayaks, Bikes & Game Room! Property 11: Private Log Cabin in Bend w/ Deschutes River View! Property 20: Now Accepting Reservations for 2019! Property 23: Cozy, family-friendly home with shared pool - close to town. Free SHARC access! Property 24: Riverfront Cabin backs to Nat'l Forest, near Sunriver w/Hot Tub, Fire Pit, Kayaks and Pet Friendly. Property 29: Gorgeous home w/ SHARC access - shared pools & hot tub - convenient location! Property 31: BOOK YOUR SKI WEEKEND NOW!! GREAT CABIN, GREAT RATES!! Property 32: Wood-beamed cabin with shared amenities (pools & hot tub) + SHARC passes! Property 40: Dog-friendly cabin close to the Village - SHARC passes included! Property 44: Cozy cabin w/ private hot tub, entertainment & SHARC passes - dogs ok! Property 48: Mirror Pond - Cozy cabin that sits on Mirror Pond - Great views of Deschutes River! 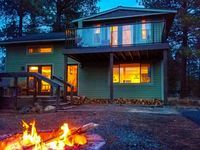 Homey cabin w/ private hot tub, entertainment & SHARC passes! Property 49: Homey cabin w/ private hot tub, entertainment & SHARC passes!